Carlton Cole In, Ryan Babel Out At Liverpool? There’s nothing like a good transfer deadline day, and this is nothing like a good transfer deadline day. So far the highest profile switch we’ve witnessed is probably Birmingham’s snaffling of Barcelona flop Aleksander Hleb on a season’s loan, or maybe Fulham left-back Paul Konchesky joining Roy Hodgson‘s quiet revolution at Liverpool – although that particular deal had been on the cards for some time now. However, the relative lack of actual action hasn’t stemmed the steady flow of glorious, glorious rumours doing the rounds today. Whether plausible, debatable or just downright laughable, speculation has been rife – check out Pies’ Live Deadline Day Chat widget for evidence! 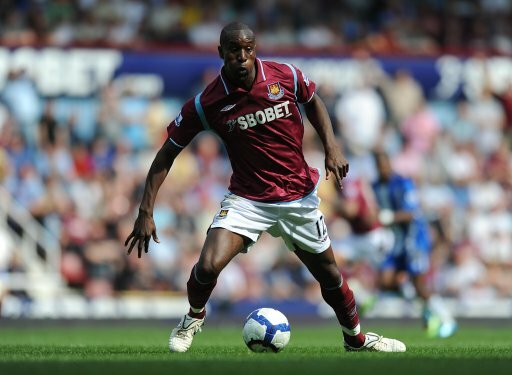 One rumour that has refused to go away over the course of the day is that West Ham target man Carlton Cole may be about to up-sticks and join Liverpool in a deal worth anything between £4 million and £8 million. The transfer apparently hinges on whether or not Liverpool can successfully offload Ryan Babel, with both West Ham themselves and Tottenham being mooted as potential suitors. Word on the wire is that Babel is currently hovering over London in a private helicopter flitting between the two clubs in an attempt to hammer (pun shamelessly intended) out a last-ditch end to his Anfield misery. Of the two, White Hart Lane seems to be the more likely destination for the Dutchman, with a £9 million fee reportedly being fixed and negotiations over personal terms said to be underway. selling babel or getting Cole ? TOTAL CR*P….why don’t you go on twitter! ….you might get to know the truth!…straight from the horses mouth…..RYAN BABEL himself! !….bunch of anti-LFC media morons!!!!!! @ynwa: You are aware of how the concept of linear time works aren’t you? My god, why would any team buy Carlton Cole? This is a big big big step down for Liverpool. Babel is a good player with great feet and touch, give him game time and support him. Carlton Cole is like Bambi on Ice. The shameless surge by the Media in trying their hardest to make a Leeds, out of Liverpool FC, will NEVER succed, Why?, because LFC is not just a football club, it is an INSTITUTION!! !